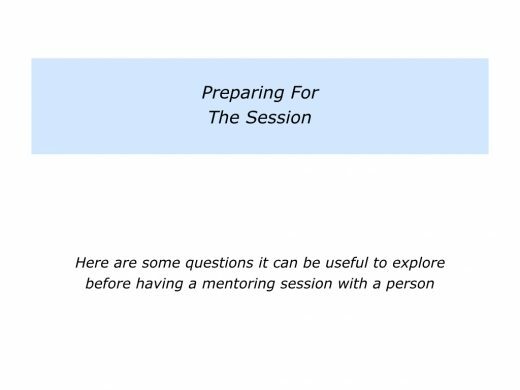 Imagine that somebody has asked for your help as a mentor. You will probably begin preparing properly for the session. 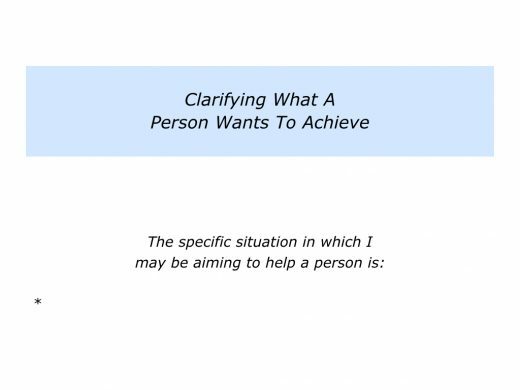 It will be important clarify what is happening in the person’s world and how you can help them to achieve their goals. You will start the actual session by helping the person to feel welcome. The next step will be to clarify the topics they want to explore and establish the real results they want to achieve. You can then share practical tools that work to help them to achieve their goals. There are many ways to help a person. This article looks at some steps you may wish to take. Good mentors prepare for the session. One approach is to gather your thoughts and focus on the person you are going to meet. 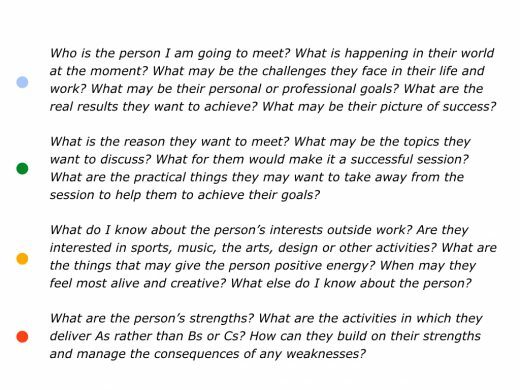 Here are some of the questions you may want to explore about the person. Doing this prework will also help you to clarify how you can help them during the session. Good mentors create a positive environment in which a person can feel welcome and at ease. They help the person to feel valued and the centre of their world. They create a stimulating sanctuary in which the person feels able to explore their challenges and goals. Here are some of the things you may want to say when clarifying what the person wants to explore. You will, of course, do this in your own way. As you know, we can focus on any topic that you would like to explore. We can look at how to tackle specific challenges or achieve your particular goals. Once we have settled on the first topic, I will probably ask you lots of questions to build up the picture. Then, if is it okay by you, I will share some ideas and practical tools that you can use in your own way. Let’s begin by seeing things in context. What is happening in your world at the moment? Are there any particular challenges that you face? Are there any particular goals that you would like to work towards? How can I take the next step in my career? How can I make a living doing satisfying work? How can I manage my bosses who keep changing their minds? How can I encourage my child – who loves to learn when pursuing their hobbies – but finds it difficult to deal with school? How can I set up and run my own business? How can I turnaround a difficult team? How can we manage some of our dysfunctional leaders so we can get on with our jobs? How can we build a values-driven organisation? Clarity is crucial. 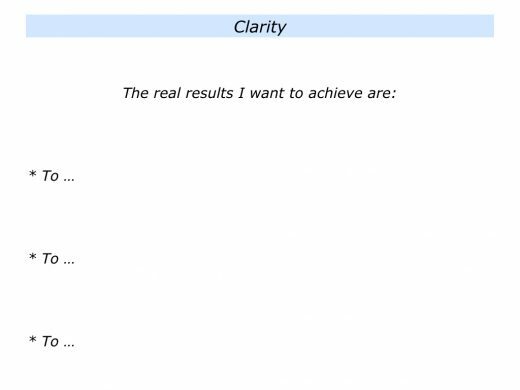 It is important to clarify the real results the person wants to achieve – the real ‘What’ – before moving on to the ‘How’. Dare to spend a lot of time on this stage. Bearing in mind what the person wants to talk about, you may then ask some of the following questions to establish the real results the person wants to achieve. Which of these topics would you like to explore first? 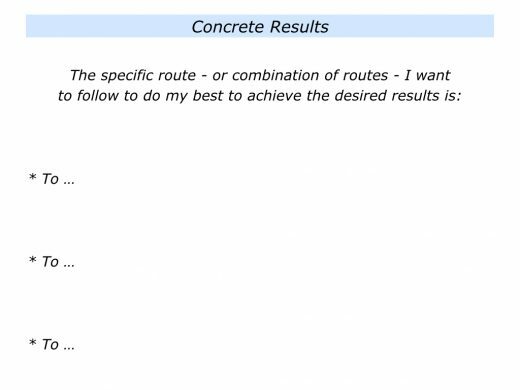 Looking at this topic, what are the real results you want to achieve? What is your picture of success? Sometimes this process takes a little time, but it is a vital step in goal setting. 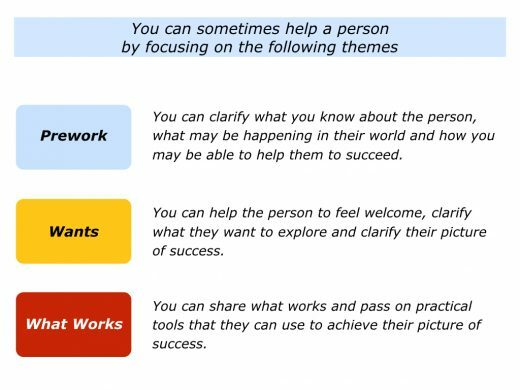 Here are some examples of how a person’s original topic can change during the process of exploring the real results they want to achieve. Let’s return to the person you are helping. You can play back your understanding of what they want to achieve by saying something like the following. Is that right? Are there any other things that you want to achieve? Describe a specific situation in which you may want to help a person. 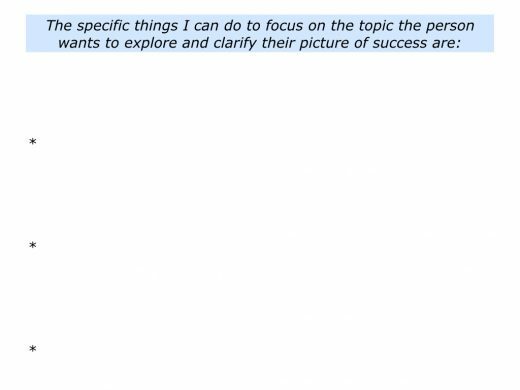 Describe the specific things you can do to focus on a topic the person wants to explore and clarify their picture of success. Good mentors clarify a person’s goals. They then pass on knowledge in a way that the person can use to achieve their picture of success. Different mentors do this in different ways. One classic approach is to sit alongside the person and do some creative problem solving. 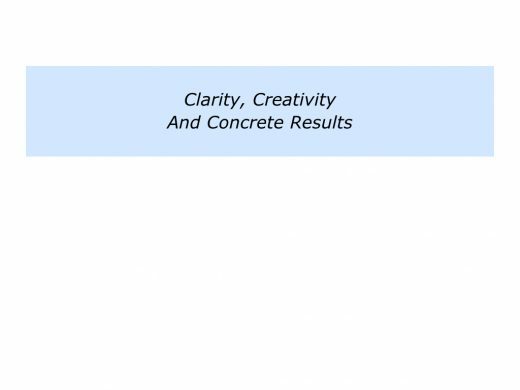 This often involves helping them to work through the following steps by focusing on clarity, creativity and concrete results. Many mentors use this approach to help a person to explore the possible ways to achieve their goals. At a certain point, however, they may also share their knowledge in a way the person can accept. Before doing this, however, they make a contract that it is okay to share their ideas. They will say something along the following lines. So far we have explored some of the potential ways forwards. The person will probably agree, but this psychological contract is crucial. They are then more open to the knowledge and practical tools that may help them to achieve their goals. Good mentors are sometimes defined as wise and trusted advisors. This does, however, highlight a paradox. Wise people seldom see themselves as wise. Whilst acknowledging they have some expertise in a certain area, they also believe they have much to learn. They demonstrate humility, rather than hubris. To simplify what worked – but in a profound way. Building on what they had learned from studying success, they then passed on this knowledge in a way that enabled people to reach their goals. They offered positive models and practical tools that people could use to follow their principles in their own ways. 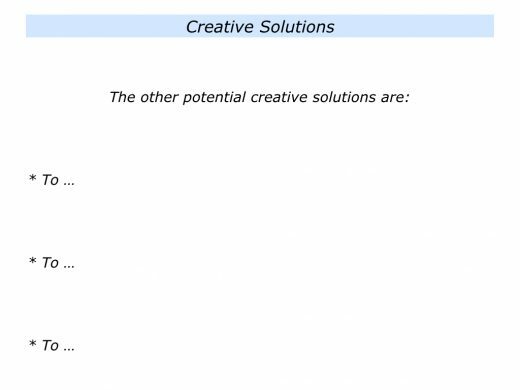 Such mentors describe the other potential solutions and, if appropriate, share what is most likely to work. They say something along the following lines. There are several possible ways forward. Looking at the situation you face, however, I can share what we know is most likely to work. There is nothing guaranteed, of course, but I can outline what other people have done to get the desired results. 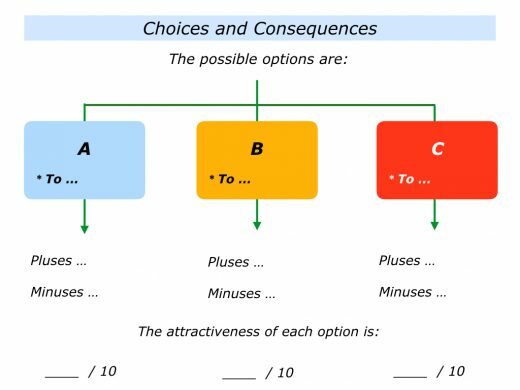 We can also look at how you can follow certain strategies that will increase the chances of success. I will try to give concrete examples that relate to your daily life and work. I will also provide some practical tools that can be used to get the desired results. You can then, if you wish, decide if you want to follow some of these principles in your own way. Is that okay? Good mentors share their ideas. They check which resonate with the person and then outline these in greater depth. They do, however, respect the person’s right to choose their own way forward towards reaching their goals. “But how do you know if something works or if, over time, it is still working?” somebody may ask. This is a valid question. 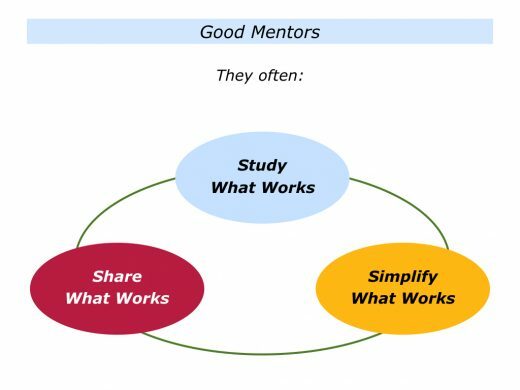 Good mentors keep studying what works in their chosen field. They clarify whether a particular approach is working for people on both a feeling level and factual level. If so, they identify the principles that people are following to achieve success. They then provide practical tools that other people can use to, if they wish, follow these principles in their own ways and get positive results. Describe a specific situation in which you may be able to help a person. 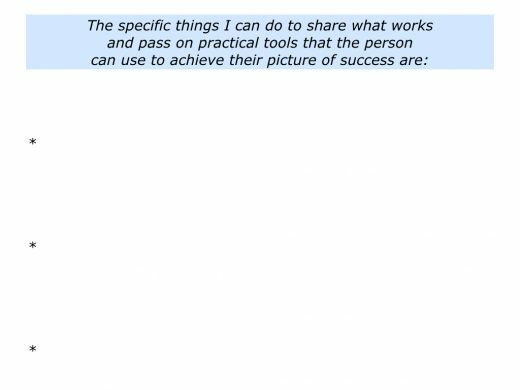 Describe the specific things you can do to share what works and pass on practical tools that the person can use to achieve their picture of success.